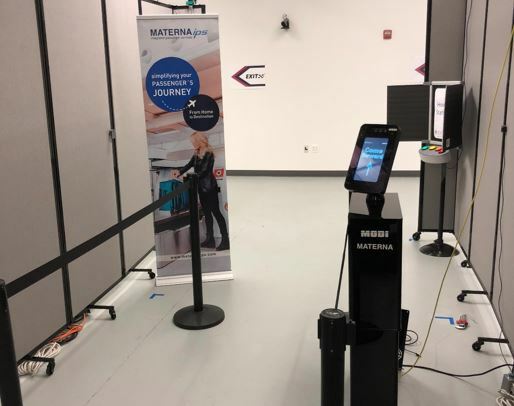 Materna, in partnership with MODI, is excited to be participating in the Department of Homeland Security (DHS) Biometric Rally in Washington, DC as one of the twelve selected vendors permitted to test and showcase their biometric solution with DHS. DHS announced this biometric event in the fall of 2017 allowing biometric providers to participate in the Rally, occurring now from March 12 to 23. We show our solution “Biometrics on the Move” allowing speed of throughput. Last week, DHS allowed VIP’s from various government agencies, airlines and airports and industry to observe the Biometric solutions from the vendors, in Washington DC. As part of a rally videography, the participants were able to go through the test setup of a check-in, where a biometric adjustment was made via an integrated camera. Each rally participant team was responsible for complying with its export control and proprietary information policies. Materna develops versatile modular biometric & check-in/Self bag drop solutions that are really easy to integrate in to the passenger journey.